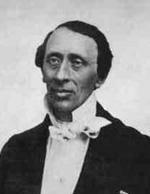 Hans Christian Andersen was a Danish writer of fairy tales, poet, novelist and dramatist. A skilled writer in all these genres, he owes his worldwide fame to his fairy stories. Always popular with children, the 168 tales contain a mature wisdom together with whimsy. Andersen invested stories of folk and legendary origin with moral and symbolic significance. His tales appeared from 1835 to 1872.